Britney, Lindsay, Paris, and crew may be total train-wrecks but you know who has their crap together? The Boston Red Sox. After being down 3 games to 1, the Sox were basically counted out, as they had to win the next 3-games in a row in order to make it to the World Series. 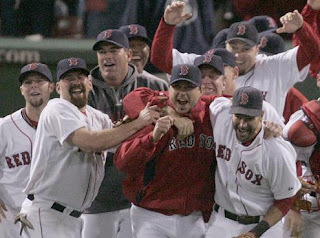 If you’re a Boston fan, you knew that this was completely possible as we’ve done it before (against the Yankees in 2004. Biggest choke in sports history…ring a bell?). Last nights game against the Indians was a do or die situation in game 7 and the Sox pulled out the win (11-2 ouch) and will be starting game 1 against the Colorado Rockies on Wednesday. This is big for me for a variety of reasons with the top two reasons being: (1) We’re in the World Series, baby! (2) Game 1 starts on Harriet Carter Wednesday. That has to be a good sign. Anyway I’m sure the Indian’s fans are drying their tears with their white towels that they had been swinging around their heads like they were all at a bad Italian wedding. Indian’s? Might be time to update the name. Native Americans? Cleavland Native Americans. That has a nice ring to it. Perhaps it will bring some good karma to them. Don’t ever count out the Red Sox. See you at the World Series!! !